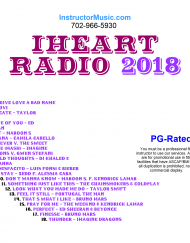 The best that radio has to offer was honored last week during the iHeart Radio Awards ceremony. Performers included Ed Sheeran, Camila Cabello and Bon Jovi. Our spotlight workout mix contains the noms and winners in the major categories. Highlights include the debut of Taylor’s new track, “Delicate” as well as a double shot of Ed Sheeran and Maroon 5. This mix is PG-Rated. Andy Grammer’s latest track is an uplifting crowd pleaser so it kicks off the new fitness music. Other current favorites are mashed up with classics. Michael Jackson and Beyonce, Flo and Fiddy…These put a new, exclusive spin on your music! Brand spanking new jams from Grammy winner best new artist, Meghan Trainor and “The Voice” judge, Gwen Stefani round out a crowd pleasing aerobics music!